It is almost that time of the year again. 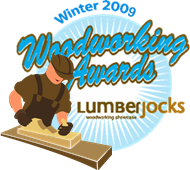 The 2009 Winter Woodworking Awards from LumberJocks.com are just around the corner. LumberJocks.com is an online woodworking community where users can share stories, photos, and videos about their own woodworking projects. The woodworking awards are a chance for members of LumberJocks to compete against each other to win great prizes. All entries will then be judged by other members, and the person with the most points is the winner. This winter the two entry categories are A Knot Like No Other and A Secret Compartment. If you want to put your skills to the test, head on over to LumberJocks and enter. If you are somewhat mechanically inclined at all, you can build this thing yourself from...	3 days ago.